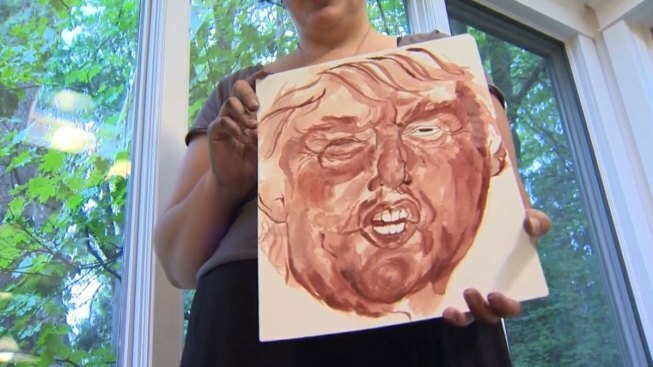 A Portland, Oregon, artist is defending the use of her menstrual blood to draw a portrait of GOP presidential frontrunner Donald Trump. Sarah Levy posted her depiction of Trump to her Facebook page on Sept. 12, calling the work "Whatever" and saying it was created with "Menses on matte board." She collected blood for it with a Diva Cup. The painting's title is a reference to Trump's comments about Fox News anchor Megyn Kelly following the first GOP presidential debate in August. Trump said that Kelly, while questioning his past comments denigrating women, was bleeding from her eyes and "wherever." The remark was widely interpreted to have been a reference to menstrual blood. Trump later said he meant Kelly's nose. "I heard his comment to Megyn Kelly and was outraged," Levy told NBC affiliate KGW of the inspiration for her painting. "He had the gall to insult Kelly's intelligence through just saying she was on her period," she said. KGW said it received more than 2,700 comments in two hours after the station posted a story about the drawing. Most were disgusted by the work, KGW said. But Levy said what disgusted her besides the Kelly insult were Trump's comments about the Mexican and immigrant communities. Levy began drawing two years ago to cope with her mother's sudden death and has since created lavish portraits — in charcoal — of political and historical figures, KGW reported. Levy is auctioning the Trump portrait and will donate the proceeds to an immigrant rights group based in the U.S., she said. She is also selling posters on Etsy. Trump leads the GOP field with 30.5 percent support from Republican voters, according to an average of national polls by RealClearPolitics. The Trump campaign has not yet responded to a request for comment on the painting.